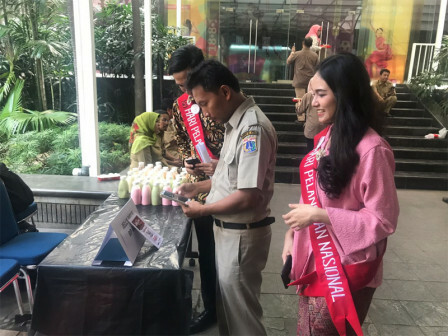 In order to commemorate National Customer Day, DKI Bank offers special prices for any foods and beverages purchase at Balaikota to its customers who use cashless transaction application, JakOne Mobile.
" Food in here is usually sold around Rp 10-20 thousands per item, now it can be bought at Rp 409 only"
In this event, JakOne Mobile users can buy any food and beverage with Rp 409 for each items. "Food in here is usually sold around Rp 10-20 thousands per item, now it can be bought at Rp 409 only," stated David, one of the JakOne Mobile users, Tuesday (9/4). DKI Bank Corporate Secretary, Zulfarshah explained, this event is one of DKI Bank service towards its customers in National Customer Day. Each item is sold Rp 409 means it is the 4th day of 9th month. "In this chance, we also launch our tagline, Senyum Pelanggan, Senyumku Juga. This tagline becomes one of our commitments," he stated. "Currently, there are 7,600 entrepreneurs from UKM level to big business level who have participated in cashless transaction, JakOne Mobile, with total 155 thousand customers," he informed.